MOON is the theme at the Three Muses this week. I apologize to Mr. Marc Chagall for being inspired by his awesomely beautiful work Lovers in Moonlight. 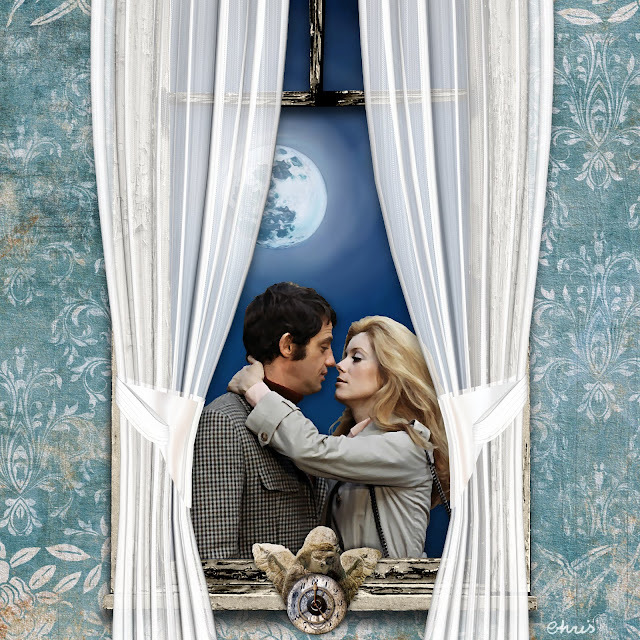 Couple: Catherine Deneuve and Jean-Paul Belmondo in Mississippi Mermaid; thanks to Createwing Designs, Studio Manu and Art-e-logy. So romantic, beautiful composition with J.P Belmondo and Catherine Deneuve! Absolutely beautiful, Christine, and a great quote to go with it. Gorgeous. Nice lovestory Vision. Great couple. Deneuve is one of my fav. So romantic and beautiful, Chris. Fantastic work. Beautiful peek through the window, Chris. I love it!